Ur tastebuds will thank u for taking them to this place …… only if u have started to appreciate the tastes & flavors of the Far East. Cuisine Type : Non vegetarian & Vegetarian. At the face of it the dishes sound expensive – Rs. 600 to 1000 but when they r served, u realize there are around 6-8 different, exciting, cool & tasty accompaniments. The tastes, flavors & the whole experience in this place is memorable. We went for the mixed meat grill & to our pleasant surprise, a live grill trolley was brought to our table & we were served the food straight from the grill ……….. awesome. 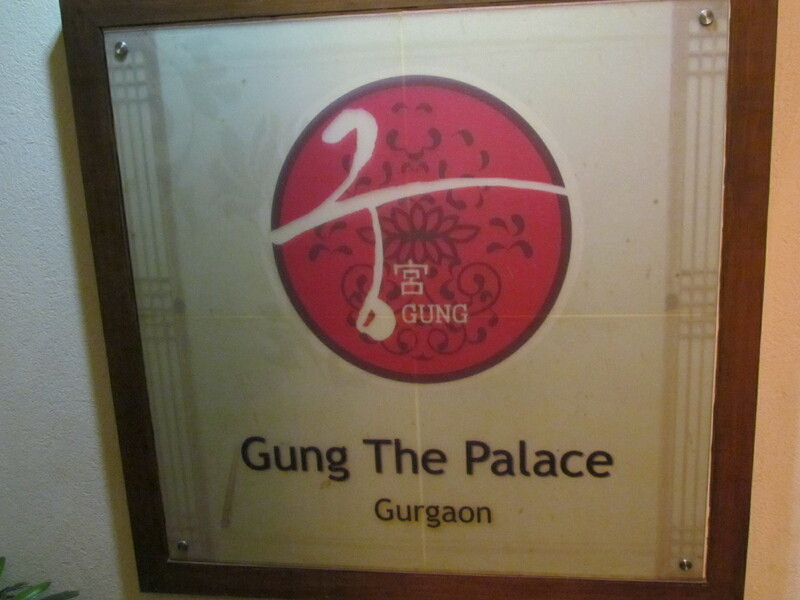 We went to Gung the Palace, with crossed fingers after a very ‘average experience’ at the famed Kumgang Gonie at The Ashok, New Delhi. 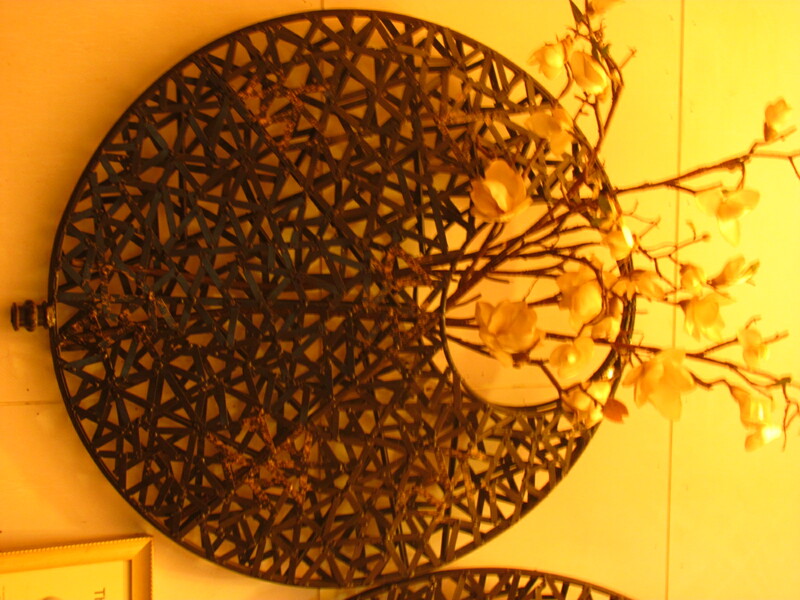 As we entered, a young Suited Korean Guy welcomed us & showed us to our table. Later we came to know that he was the General Manager of the Restaurant. Soon after sitting we noticed that the room is lined with cabins whose doors were shut. Outside each door there were many shoes. While we were wondering as to what was happening, one of the doors opened & we saw a Korean gentleman come out. Inside the cabin, people were sitting on the floor around a table and having dinner in the traditional way!!! The General Manager then introduced us to the attendant & gave us the menu card – within seconds we figured out that we could not understand what to order. So we asked him about the most popular dish & he showed us two chicken dishes. After few seconds of being surprised, I asked chicken? Then he came up with ‘chicken is what the Indians like’ vs ‘two options that the Koreans like’. Needless to say that we ordered the mixed meat & seafood grill that the Koreans like. 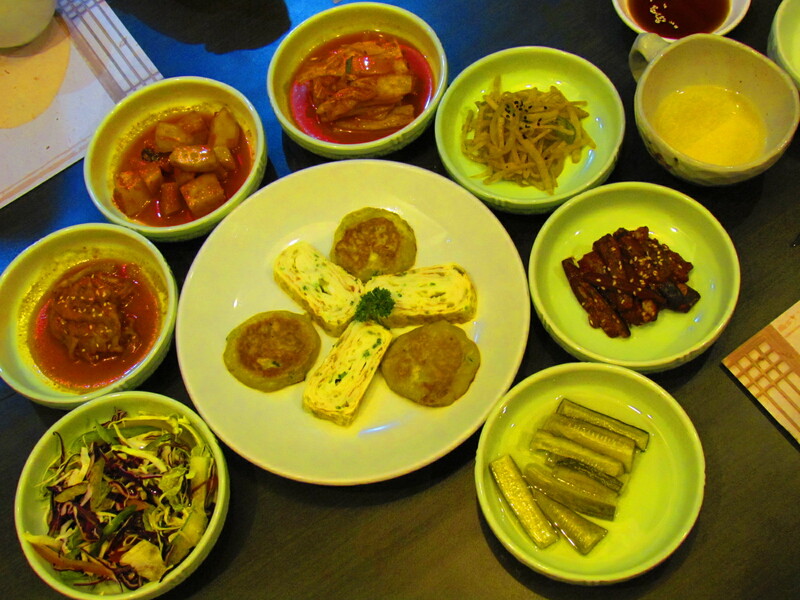 First came the famous kimchi salad along with omlettes, green leaves, veggies, nuts, etc as starters on the house – There are a total of 6 to 8 accompaniments. The Kimchi served here has a definite fermented feel to it. Sauces were served in small bowls…. pls do not ask names….my ,memory is too feeble to remember them. 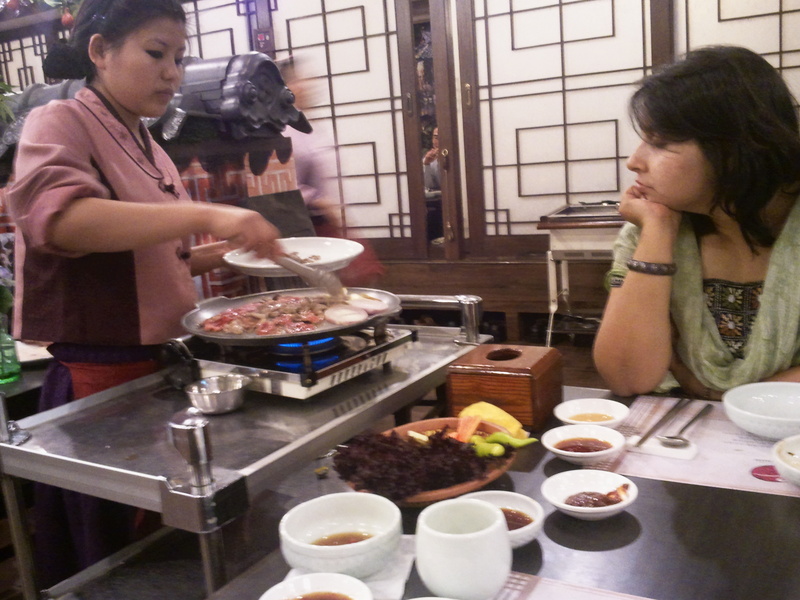 Then came the live trolley grill – a portable cooking station in which a traditionally dressed (looked like) Korean girl grilled the miscellaneous meats to perfection – I can feel my mouth-watering even as I write this post. The evening was a delight & a truly wonderful experience. Very Very Highly recommended. 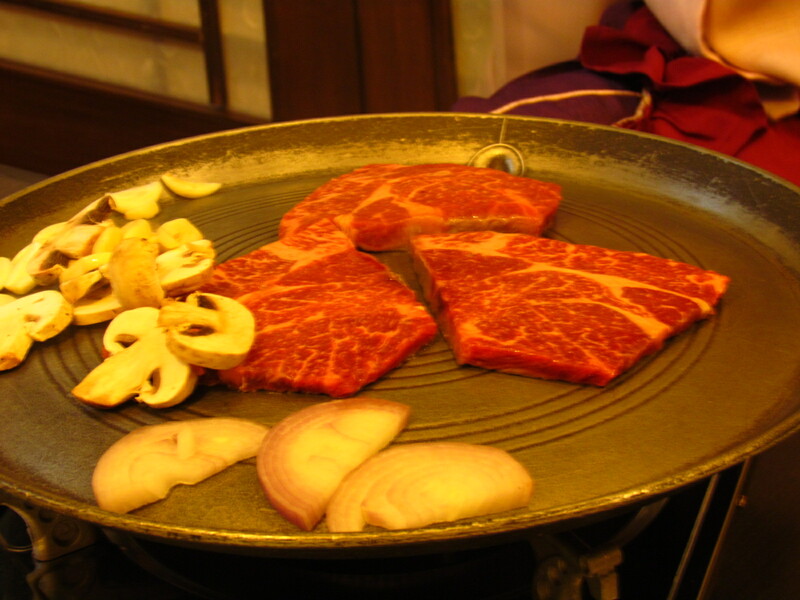 Barbequed sirloin – the flat strips of sirloin were pan grilled with onion strips & garlic strips – on a live grill at the table. These were then cut with scissors to bite size pieces & served. There was an excellent barbeque sauce with which we had this. Stir fried octopus with onions, zucchinis, mushrooms & other veggies – very very good, a bit low on salt, overall very different from the ‘chinese stir fry’ & tasty – the octopus is a bit chewy but good. 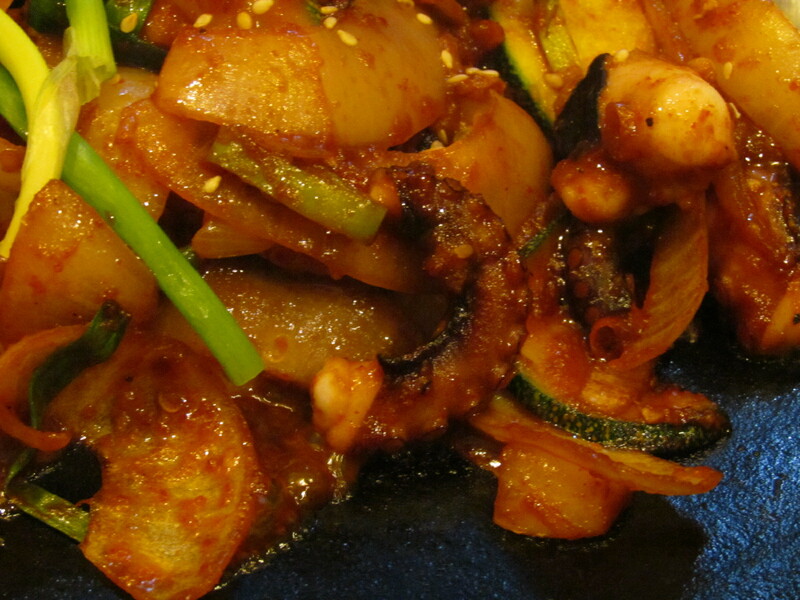 In case u r yet to taste it, octopus is pretty close to calamari. Seafood casserole – miscellaneous seafood & few veggies put into a broth delivered on top of a live oven on the dining table. 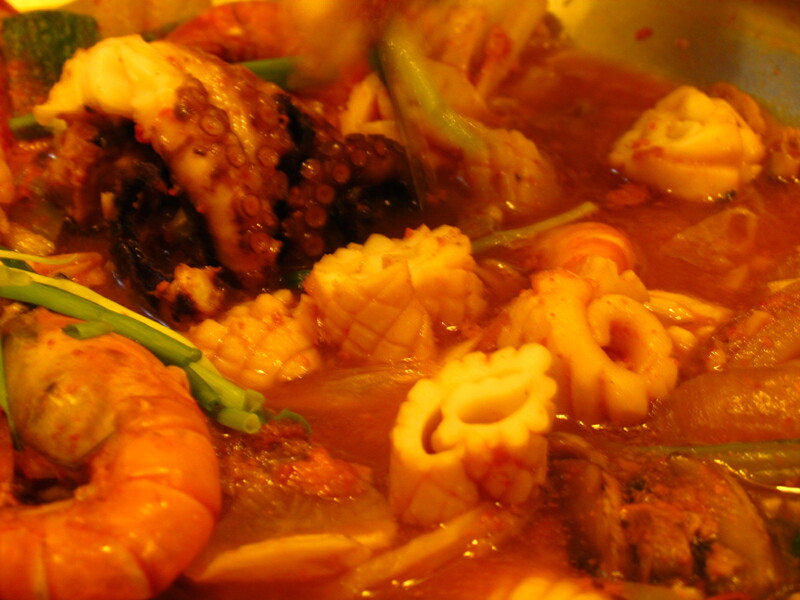 Marvellous – The juices of the seafood merged into the broth & made it good beyond explanation. 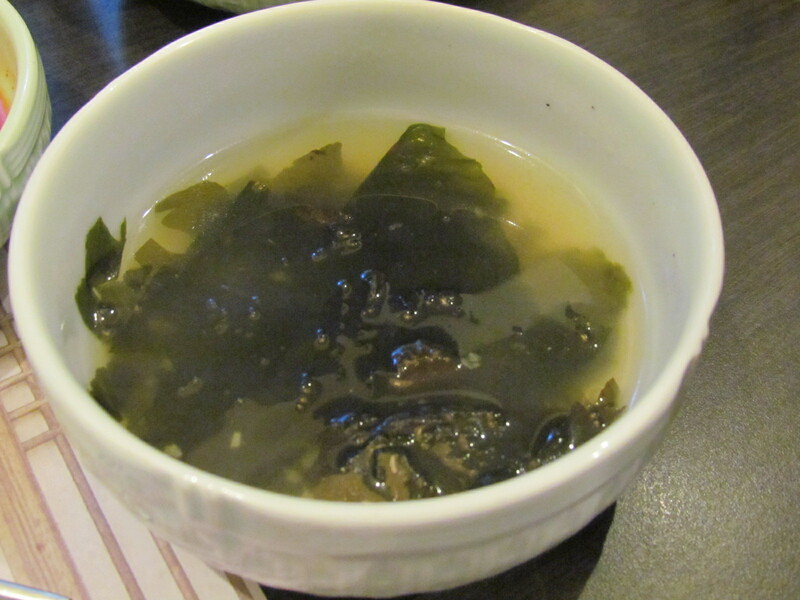 A seaweed soup that was served was also very interesting – just seaweed in water it seemed but was very very nice & refreshing. 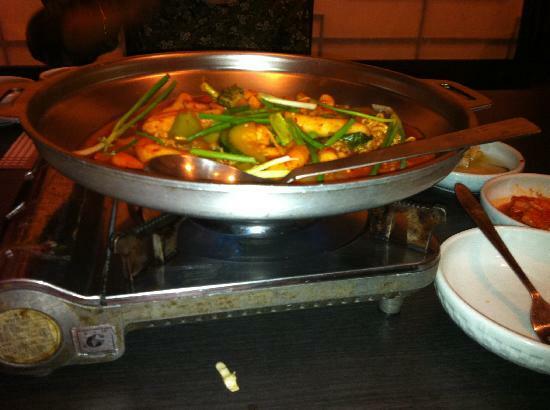 Initially we were skeptical about going to a Korean restaurant because we are pure vegetarians. But we were pleasantly surprised to see a decent spread of vegetarian dishes. The restaurant had a pleasant oriental music playing in the background and we were ushered into a small enclosure with sliding doors which had a table in which 6-8 people could dine at a time. We had to take off our shoes/slippers before entering inside. The best part was that the menu was very clear with pictures of all dishes and clear indication of veg/non-veg. The hotel manager could speak very clear english and hence we had no problems in selection of our dishes. They served 7 varieties of salads (complimentary) and all of them tasted very nice and different (picture attached). Then we got out main dish which was brought on a mini-stove to keep it hot. (picture attached). Instead of water they serve herbal tea which tasted very good. One the whole it was a very pleasant experiment and we returned back extremely satisfied.